I have been reading a few really good books written by women I admire and respect that have pushed me to take a good look at myself and my actions. While it is something I've always done through the prism of self-doubt, I am now doing it as a self-improvement exercise. What can I do better? I make a conscious effort to lead a happy, mindful, satisfied life - not only for me but for those around me. These lessons of sorts, reminders and random thoughts pop-up randomly in my mind and I thought it might be helpful to organize them into little memos that I will be sharing once in a while. 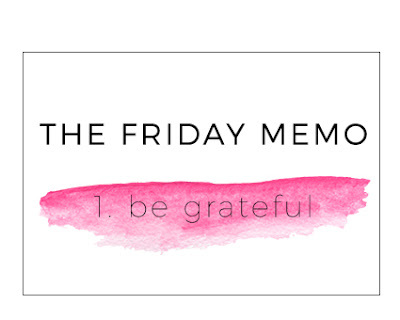 The Friday Memo this week is far from being revolutionary - but I think it might be one of the most important rules to live by. Be grateful. For everything you have. Don't apologize for your good fortune, or be embarrassed by it. Embrace it. But be grateful for it everyday. ▹ The 104 years my great grand-mother was able to spend on this Earth. It will soon be time to say goodbye, but having her in my life throughout my childhood, teenage years and adulthood has been a true privilege. ▹ Great friends, old and new, who make 5000 miles feel like 5 yards and an hour feel like 1 minute. ▹ My supportive husband, my funny little boy, our health, Infant Tylenol, our not-so-perfect home, wifi, the amazing women who've agreed to be featured on this blog, and so much more!